Joy Creek Photo Archive (c) all rights reserved Saxifraga hirsuta is definitely a plant that prefers part shade and adequate moisture throughout the season. Although it is related to Saxifraga 'London Pride', it does seems very dissimilar in appearance. It is small in scale and has open rosettes. Its leaves are kidney shaped, not spoon-shaped, and they have hairy petioles. Flowering stems can reach up to a foot in height and bear panicles of small white flowers. 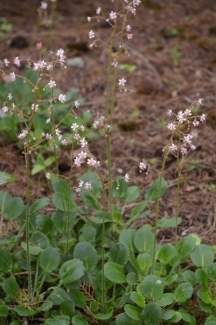 This saxifrage is indigenous to the Pyrenees, eastern Spain, and Ireland. May to July. 2-3 in. x 10 in.